Prepare Your Fireplace for Spring! You don’t have to abandon your fireplace every time spring rolls around. Besides kindling the flame on those colder nights, what should you do when the frost thaws and the flowers bloom? From cleaning your vents to upgrading to a linear gas fireplace, here are a few ideas that can help you make the most of spring. If you have one of Lyric’s direct vent gas fireplaces, you won’t need to go through the hassle of sweeping the chimney, clearing out the ash, or removing the soot, but you still need an annual check to ensure that your fireplace stays flame-ready and lasts through the years. Early autumn is a good time to schedule maintenance, but professionals can get busy during peak season, so you may want to switch your yearly inspection to spring. If you’re still saddled with an old wood-burning fireplace, this spring might be the time to upgrade to a cleaner, more efficient, more stylish model. With direct vent technology, linear gas fireplaces not only give you less mess and better performance, but also more beauty, more options, and greater safety. From Power Vents to Safety Screen Barriers, from colored glass media to Cool Wall technology, from free-standing fireplaces to see-through fireplaces, today’s models have enough advantages to justify the cost of an upgrade. 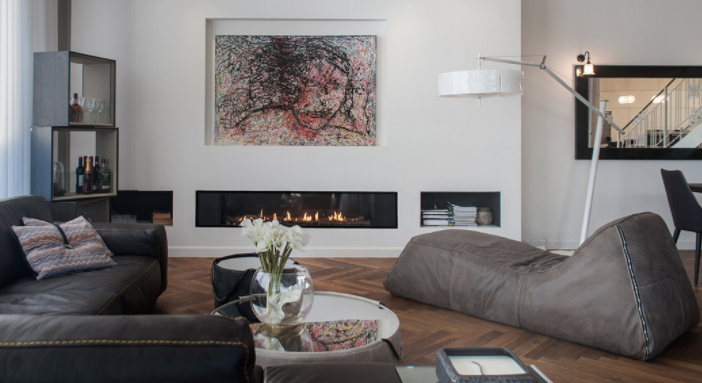 Fireplaces can elevate any living room, but nothing says they have to stay there. Nowadays, you can find gas fireplaces in kitchens, bedrooms, bathrooms, and even hallways. With months to spare before the next cold snap, you have plenty of time to select the perfect model, sort through your options, and install a brand-new fireplace before it becomes an absolute necessity. A little décor can go a long way toward improving the look of your fireplace, and there as many ways to do it as there are fireplace owners. You could add a holding space for decorative logs, install bookshelves along the wall, invest in some pottery for the ledge, or even place a simple wicker basket beneath or beside the fireplace. With Lyric’s Cool Wall Technology, you can hang paintings, photographs, mirrors, and electronics above the fireplace without fretting about heat damage. Who says you can only light a fireplace in fall or winter? A flickering flame is as beautiful on a spring evening as it is on a winter evening. And the days may be getting lovelier with each passing week, but, when the sun goes down in spring, the temperature still drops. Keep the fireplace lit throughout April and even May to keep your home nice and cozy on colder evenings. Lyric designs only the most efficient, most beautiful, most accessible ventless fireplaces. Browse our collection to find them and install the perfect fireplace before winter returns to drive away the sun.